Taylor Swift’s recent decision to yank her music off of Spotify, the online music streaming service used by more than 50 million people, has become the latest episode in the battle over the music industry’s diminishing profits. One central mystery in the drama: just how much do artists make when their songs are played on the service? We used Spotify’s stated payout range – $0.006 to $0.0084 per stream – to calculate how much the top 50 songs streamed globally earned artists in 2014. See the bar charts below for each song. The payout range represents the top and bottom figures for each song as described by Spotify’s latest publicly available formula. Spotify provided its “per stream” range in 2013 in an attempt to satisfy curiosity about the company’s royalties formula, which factors in total revenue made by Spotify and total streams across the site, both unavailable to the public. Regardless of the exact per stream payout each month, Swift’s chart-topping single “Shake It Off” earned more than any other song in October. 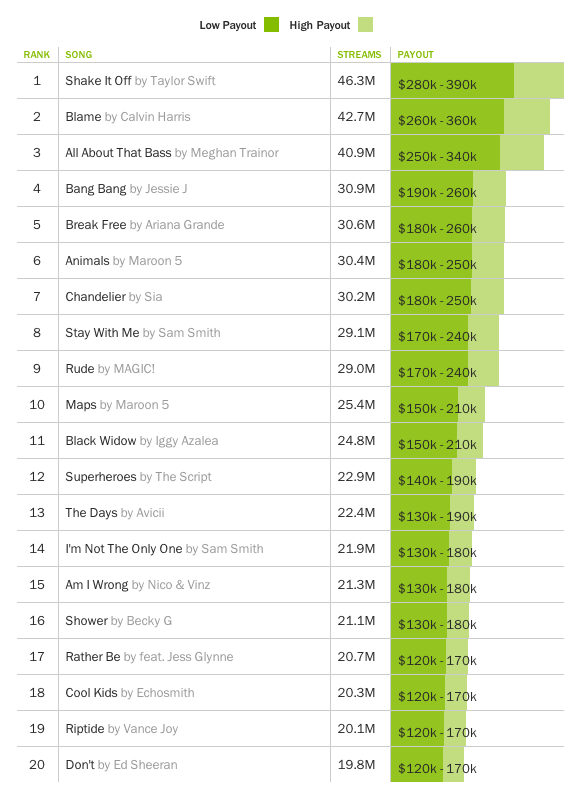 But having spent only 7 weeks on Spotify, Swift’s single can’t compete with the top 20 best-paying songs from the first 10 months of 2014, like Calvin Harris’s “Summer,” which could have netted the Scottish singer $1.7 million. Spotify’s CEO Daniel Ek has said that since the company was founded in 2008 it has paid out $2 billion to record labels and publishers, half of that total in the last year alone. In a recent blog post, he said that an artist of Swift’s size could earn $6 million by streaming her music on Spotify in the past year. When contacted by TIME last week, a Spotify spokesperson said Swift had earned $2 million off global streaming of her music in the past year. Swift’s record label, Nashville-based Big Machine, said last week that it had received exactly $496,044 for domestic streaming of Swift’s music over the past 12 months. While few are going to fear that Swift is about to go begging, the fact that the country’s best-selling artist believes Spotify devalues her work could have a major influence on whether other artists stick with the service. Read Taylor Swift’s interview with TIME. Read more about Taylor Swift’s Spotify paycheck mystery.